87% percent of physicians use mobile devices in their practice today. With cell phone usage in the healthcare industry exuberantly high one might ask an important question: Just how clean are these phones? An investigation conducted by St. Louis University showed that 83% of phones carried into the operating room were contaminated with pathogenic bacteria before disinfection. Even more alarming was that after standard disinfection methods 8% of the phones were still contaminated. Standard disinfection of mobile devices is not 100% effective. 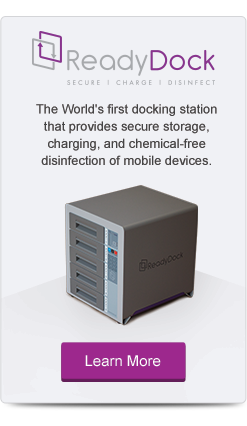 Mobile devices are challenging to disinfect. Device manufacturers recommend they be cleaned with microfiber cloths and many chemical solutions are harmful to screens. Disinfecting devices is often overlooked in hospitals. 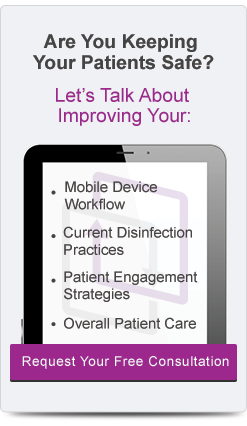 Only 23% of clinicians disinfect their phones on a regular basis and there are no universal guidelines for disinfection. 100% of healthcare workers polled don’t know their hospital’s disinfection and cleaning recommendations. With the high amount of pathogenic bacteria on cell phones a thoughtful approach to disinfection is important, if not critical, to not undermine proper hand hygiene procedures. Cell phones act as reservoirs for bacteria and can easily re-contaminate washed hands. In fact, nearly half of all healthcare workers don’t clean their hands after phone use. While using mobile devices has numerous benefits we must be cognizant of the fact that they harbor harmful microorganisms and need to be methodically, regularly, and thoroughly disinfected. Gary Beaumont is an undergraduate at the University of Hartford studying Marketing and Finance. At the University he is heavily involved in extra-curricular activities, playing an integral part of the school’s student government association. He is passionate about innovative technologies, especially those that help to improve disinfection in healthcare. Gary loves the outdoors and in his free time he enjoys hiking, fishing, and reading. Shakir, I., Patel, N., Chamberland, R., & Kaar, S. (2015). Investigation of Cell Phones as a Potential Source of Bacterial Contamination in the Operating Room. The Journal of Bone & Joint Surgery, 225-231. Ventola CL. Mobile Devices and Apps for Health Care Professionals: Uses and Benefits. Pharmacy and Therapeutics. 2014;39(5):356-364. Apple, Inc. How to clean Apple products. http://support.apple.com/kb/ht3226.